Birdseye Dentistry Awards Brand Awakening Launch Leadership. 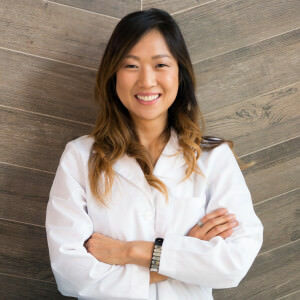 Dr. Millie Chung Now Featured at Birdseye Dentistry, Hollywood, CA. This summer there’s more than new movies coming out of Hollywood. This June, Brand Awakening is pleased to bring out a new blockbuster dental practice to the communities in and around Hollywood, CA. This thriller practice is called, Birdseye Dentistry, starring Dr. Millie Chung, DDS. Stay tuned for more launch event news and our dentist marketing showcase of work. 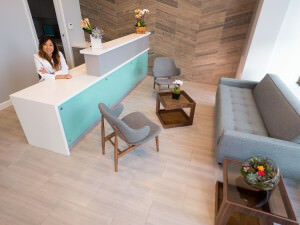 https://brandawakening.com/wp-content/uploads/2015/05/Dr-Chung-in-Treatment-Room-w-patient-150ppi-1100746.jpg 3330 3567 Liam Blume https://brandawakening.com/wp-content/uploads/2016/09/BA-logo-enfold-1.png Liam Blume2015-05-01 07:09:242016-01-11 21:28:11Birdseye Dentistry Awards Brand Awakening Launch Leadership. Participants in the Social Innovation Fast Pitch Competition were selected through a highly competitive application process based on their innovative approaches to creating lasting social change and their potential for significant positive community impact. Led by philanthropist Wallis Annenberg, the Annenberg Foundation’s Alchemy Peer to Peer event gathered more than 1,200 nonprofit leaders, funders and government officials to salute the contributions of Los Angeles’ nonprofit organizations (such as (it) magazine) and to watch the final rounds of the Social Innovation Fast Pitch competition at Club Nokia in downtown Los Angeles. Hosted by George Lopez and Jamie Lee Curtis on Los Angeles’ first official Nonprofit Day, the event offered an opportunity for nonprofits to learn new ways to expand the reach of their organizations and to meet others in the nonprofit community as well as key funders. “We were honored to be recognized by such prestigious organizations and greatly appreciate the prize awards received for our work,” said Liam Blume, Co-Founder and Publisher of (it) magazine. 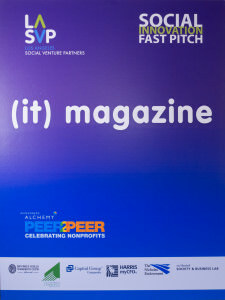 Peer to Peer was held at Club Nokia thanks to the generous assistance of Timothy J. Leiweke, President and CEO of AEG, and STAPLES Center Foundation. The event also received the support of the Entertainment Industry Foundation, the Los Angeles Business Journal and Sony Pictures Entertainment, Inc. Peer to Peer was produced by Academy Award-winner Bruce Cohen and Bruce Cohen Productions. Online magazine drives awareness of NMDP’s life-saving mission. 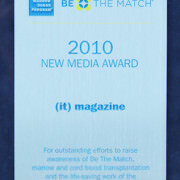 MINNEAPOLIS – Oct. 18, 2010 – (it) magazine was presented with the New Media Award from the National Marrow Donor Program® (NMDP) at its 23rd Annual Council Meeting in Minneapolis. The NMDP operates the Be The Match Registry®, the world’s largest and most diverse listing of potential bone marrow donors and donated umbilical cord blood. For thousands of patients with life-threatening diseases, such as leukemia and lymphoma, a bone marrow or cord blood transplant from an unrelated donor is their best or only hope for survival. The NMDP created Be The Match® to provide opportunities for the public to become involved in saving the lives of people with leukemia, lymphoma and other life-threatening diseases. The New Media Award is presented to an individual or group for supporting the life-saving work of the NMDP through utilization of the Internet. (it) magazine reached out to the organization via Twitter to see how the two could partner to help save lives. Background research of (it) magazine uncovered a nonprofit, multimedia organization based out of Pasadena, Calif., whose mission and primary audience aligned perfectly with Be The Match. Provided additional coverage to Be The Match via its partnerships with Time Warner Cable in Southern California and The Hotel Networks, which is distributed in luxury hotels throughout the United States, parts of Puerto Rico and the U.S. Virgin Islands. Coverage to-date has generated more than 510,000 social media impressions, 175 acts of engagement (including comments, likes, reposts, and retweets), and 230 clickthroughs and referrals to BeTheMatch.org. As a leader in the field of unrelated marrow and umbilical cord blood transplantation, the National Marrow Donor Program (NMDP) is dedicated to ensuring all patients who need a transplant receive access to this potentially life-saving treatment. Headquartered in Minneapolis, the nonprofit organization has been entrusted by the federal government through the C.W. Bill Young Transplantation Program to operate the national registry, publicly known as the Be The Match Registry, which provides a single point of access for transplant centers and patients to marrow donors and cord blood units. The organization also facilitates transplants worldwide; supports a global network of hospitals, blood centers, public cord blood banks, laboratories and recruitment centers; conducts research; and provides education and support to patients, donors and health care professionals. The NMDP has facilitated more than 40,000 transplants since operation began in 1987. Resonate! Are you and your customer a good match?